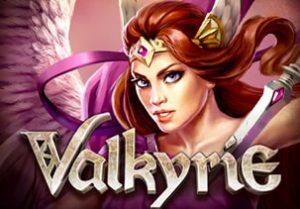 Hope to reach heavenly Valhalla in Valkyrie, an epic Norse-themed slot game from ELK Studios. This 5 reel, 1,024 ways to win saga is superbly designed and comes with plenty of extras including colossal symbols, free spins, wild reels and raining wilds. Play this volatile game on all devices from between 20p and £100 per spin. The comic book design in Valkyrie works very well. Watching over proceedings is Asgardian goddess Freya who looks like a female member of Brian Blessed’s gang in camp sci-fi classic Flash Gordon. On the reels you’ll see lower value A to J symbols plus 4 golden jewels and a quartet of Valkyries. The best of these will get you 2, 4 or 8 times your total stake if you land 3, 4 or 5 of them on adjoining reels. The golden shield is the wild. This doesn’t offer any payouts but it does substitute for all other symbols apart from the scatter. ELK Studios has packed plenty of extras into Valkyrie. It’s all about the Valhalla Free Spins feature which is triggered by landing 3, 4 or 5 free spin scatters. You’ll then receive 5, 7 or 10 free spins. Shield of Chance feature - Freya lifts her shield to summon the spirit of Odin. A selection of wilds then rain down onto the reels. Some of these will stick and a payout is made with the extra wilds in position. Sword of Destiny feature - Freya’s magically charged sword floats across the middle 3 reels. If it lands on a reel, or better still multiple reels, those reels turn totally wild. A payout calculation is made with the extra wild reels in place. Arrow of Fortune feature - this time Freya fires up to 3 arrows towards the heavens. As they land epic 2x2, 2x3 or even 3x3 symbols drop onto the reels. A new payout is made with the colossal symbols in position. Finally, you can retrigger the feature with plenty of additional free spins on offer. Furthermore, the 3 features above can also be triggered in the base game with the Bonus Spin feature – this is played when you get 3 or more Bonus symbols on the reels. You will then get 1 respin in bonus mode with 1 randomly selected feature described above. The sound, imagery and animation on show in Valkyrie is just what we’d hoped for from an ELK Studios slot game. It looks and sounds terrific. There’s a decent variety on offer from the gameplay too thanks to the Bonus Spin extras and the free spins. It’s a pretty fiery game too. This is a volatile title and the variance is high. There are potentially big rewards on offer here with the maximum payout standing at 5,000 times your total stake on every spin. The Norse theme has really come into its own in 2018. With its stunning looks and range of extras, the volatile Valkyrie is among the best of them. I also recommend Net Entertainment’s Vikings which is based on the hit television series.